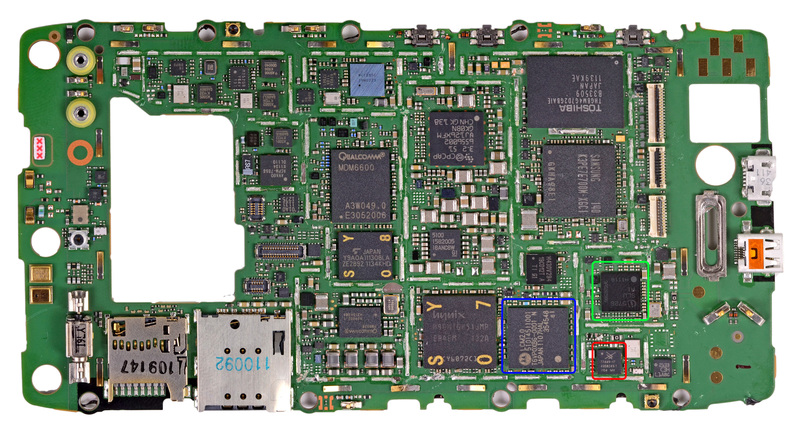 We’ve already outlined much of what there is to say about the combination of Qualcomm’s MDM6600 and Motorola’s on Wrigley LTE baseband inside the Droid Bionic review, but it still bears going over. Just like the Bionic, MDM6600 handles 1x voice and data, EVDO Rev.A 3G data, and Wrigley supplies LTE connectivity. In fact, the RAZR has a virtually identical cellular architecture to the Bionic, at least as far as I can tell. There’s the same Infineon transciever for LTE, Skyworks 700 MHz power amp, and combination MCP DRAM+NAND packages for the MDM6600 and Wrigley basebands. The reality is that almost all black boxes inside mobile phones end up revealing something similar at their heart if you poke around enough. If we were counting the number of ARM parts onboard your average smartphone I wouldn’t be surprised to see at least 4 or 5 different ARM cores. So life is good and our earlier claims that Motorola Wrigley (with lots of TI references inside) is indeed LTE UE Category 2. As a reminder, other devices based on MDM9x00, LG L2000, and Samsung’s CMC220 are UE Category 3. Oddly enough, just like the Bionic the official FCC filing summary information for the LTE side of the RAZR erroneously states that it is UE Category 1. 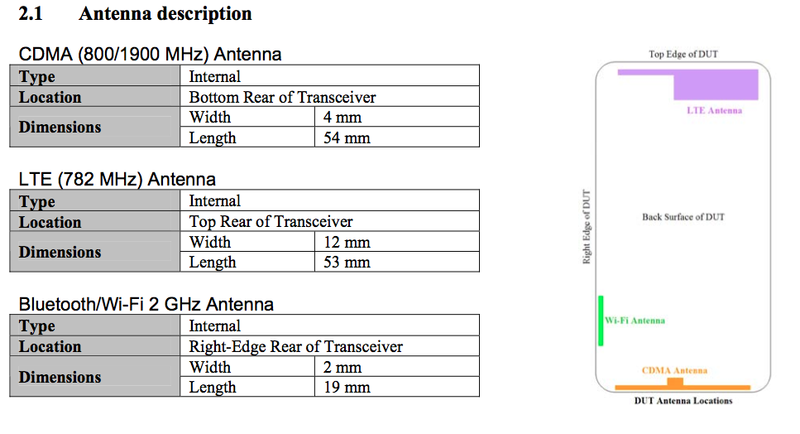 As usual we get the normal pretty diagram with the location of antennas, and interestingly enough the LTE antenna is up at the top on the RAZR instead of in a combined module at the very bottom. We’ve been doing a pretty good job keeping track of cellular throughput by running a bunch of speedtests, getting that data off, and making some graphs. The RAZR isn’t spared this treatment at all, and I ran 510 tests on Verizon 4G LTE in my own market in Tucson AZ and while on a trip to Los Angeles, CA. 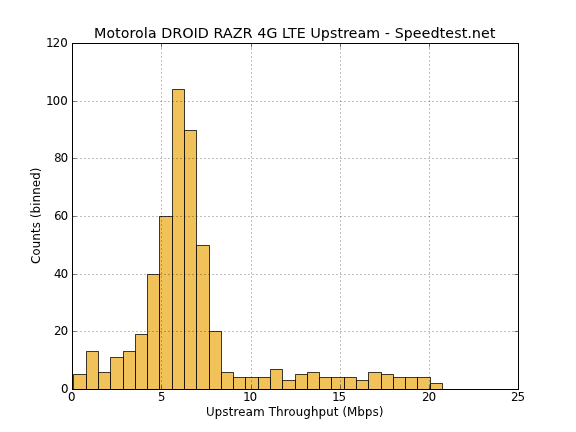 The histograms themselves look a lot like what we’ve seen already out of Verizon’s 4G LTE network on other smartphones, which again uses 10 MHz FDD on LTE band 13. I’ve seen numerous other people hit speeds above 50 Mbps on category 3 devices in favorable network conditions, but obviously the RAZR being category 2 does preclude it hitting those speeds. Like the Bionic, the RAZR also gives you a nice and easily accessible network option to use either LTE/CDMA or just CDMA. 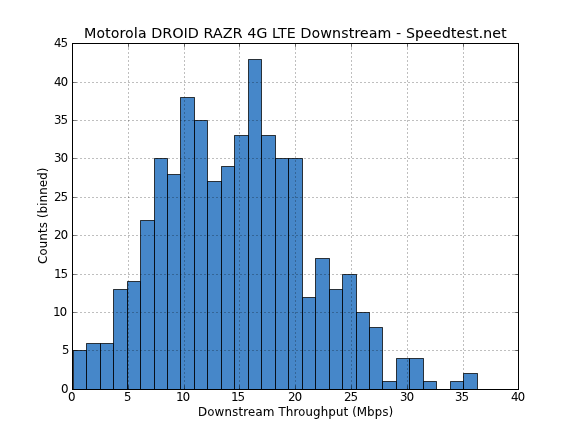 Unfortunately again there’s no way to force data on only LTE and avoid handing over, but in practice I rarely saw the RAZR do a hard handover unless network conditions completely precluded using LTE. I was pleased with myself when I used the Bionic that it was possible to look at LTE signal power (RSCP) and the channel quality indicator (CQI) by just running logcat and grepping the radio status daemon that Motorola wrote for updating their bar visualization. Unfortunately in this newer version of Blur that logging debug output and functionality is no longer, and if you look closely you’ll also notice they went from 4 bars to 5. There’s another way to view those metrics but it involves having shell on the baseband and directly querying the MIBs that correspond to all the LTE signal quality figures of merit. It’s still possible but much more involved. The upside of course is that I was able to confirm the RAZR correctly reports those bars based on signal power and quality, unlike most of the other LTE handsets which just look at power. Lastly, the Droid RAZR XT912 Motodev page notes that the phone has WCDMA 850/900/1900/2100 connectivity courtesy of the MDM6600. However, the shipping Droid RAZR has WCDMA disabled and corresponding lines commented out inside build.prop for the WCDMA components. 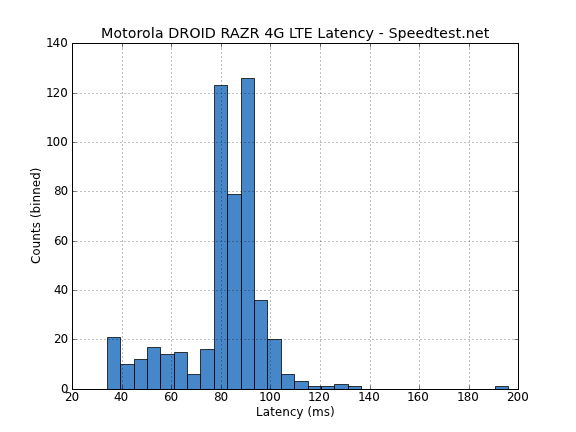 Considering the existence of the RAZR XT910 (sans “Droid”) with WCDMA and GSM I think it’s fairly easy to predict that a world mode variant with LTE is coming sooner rather than later. I wouldn’t mind having a RAZR that works on AT&T WCDMA, that’s for sure. The hands free bluetooth implementation is broken in the sense that it no longer announces whom the caller is. Every previous Motorola phone I have owned tells me who is calling. Califorina has a handsfree cellphone law and it is very important that I know whom is calling before I answer in the car in freeway traffic. Business calls I may answer, personal calls can wait. This is a deal breaker! I'm stuck with this until they fix it but I am damed unhappy and if I had known I would not have purchased it. It is more of a toy then a useful phone, granted an atractive toy, but still a toy. Does the Apple 4S bluetooth work? I am living in China, and trying to purchase the 4G version of the Razr (unlocked, of course, or at least unlockable). The Chinese version is the XT912, and does not have 4G support (which makes sense, since China doesn't have a 4G network yet). I travel back to the USA periodically, so having 4G for when I am not in China is worth something to me. I have heard said that the non-USA versions of the Razr might have 4G locked off, so this worries me. I found an XT910 brought in by grey market here, but I noticed some things that seem off: 1) it only says Razr, not Droid Razr (so it is probably not the USA version of the phone, I think it was from Singapore) 2) No documentation indicates whether or not it supports 4G, and it doesn't ship with anything other than a basic charger (if there was an external 16 GB microSDHC, it was removed by the seller) 3) Under the different networks supported in the menus, I find one that says "other" with no explanation (could be 4G, but since China networks don't recognize it, it doesn't register?). Worth mentioning that the RAZR is the second (after the 4S) phone to include support for BLE. Instead of waiting for Google to get their act together and add a standard API to Android, Moto has bundled its own stack (provided by a third party) along with a set of APIs. It says what it means in his post title, 'Bluetooth Low Energy' - basically it's Bluetooth 4.0.